This delightful blessing is the perfect birthday gift for cherished friends and family members. Its twelve expressive verses, each accompanied by an evocative image, call to mind the many ways that God's sustaining and supportive care is present each day. With the touch of a poet, Joyce Rupp calls forth a spirit of gratitude and wonder for the gift of being alive. With content appropriate for any depth of relationship, this booklet has a page for personal inscription and makes a thoughtful present for the person who seems to have everything. 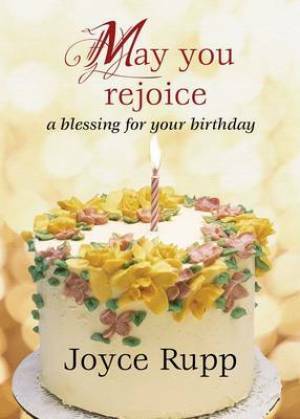 May You Rejoice by Joyce Rupp was published by Ave Maria Press in November 2010 and is our 31373rd best seller. The ISBN for May You Rejoice is 9781594712579. Be the first to review May You Rejoice! Got a question? No problem! Just click here to ask us about May You Rejoice.